The traditional way of doing video analysis has usually been for the coach to sit their players down and go through the game footage with them and pin point areas where they could or should have done better. The focus of these meetings is usually focused around errors the players have made and because of this an intensely negative environment is usually created. Players dread these meetings as they are usually admonished and for the most part, the meeting is the first time the players have seen the game footage. This is why I prefer to flip. So what is flipped analysis? Have you ever heard of it? Until recently I had not heard of it either. I am a big proponent of players knowing just as much as the coach and because of this I immediately saw the benefits of the flipped approach for knowledge transfer. Flipped analysis revolves around players doing post game analysing themselves just as much as the coaches usually do and as such they have a pretty clear idea of what happened in the game and form opinions that may be in contrast to that of the coaches. The flipped approach has the players take responsibility for their own analysis instead of relying on the coach to do it for them. The basic idea of this approach is that players do just as much analysis themselves if not more than the coaches. The side I coach and analyse for are all university students, while the coaches are all full-time teachers and as such their time is limited and finding the time to get all players and coaches into the same venue at the same time is usually difficult. Lectures, tutorials and school sport ensure there is no time for one on one analyses, nor in depth team analysis. This is where Dartfish TV comes in. This is my first year trying the flipped approach after having done the traditional approach for four years and from what I have seen thus far it is highly encouraging. The way we approach the video analysis sessions now is to have the video session later in the week allowing players a chance to view the videos and discuss, analyse and think about their opinions about what occurred during the game, and what they could have done better and more importantly what they did well, before the coach even has a chance to give his views of what occurred in the game. The success of this approach was clearly shown in the viewing statistics of the clips where 2000 views were recorded after just two games. This phenomenal viewing statistic indicates that this approach was a big hit with the players and the coaches as they could now view the game at their own leisure at home or at university and as often as they wanted. 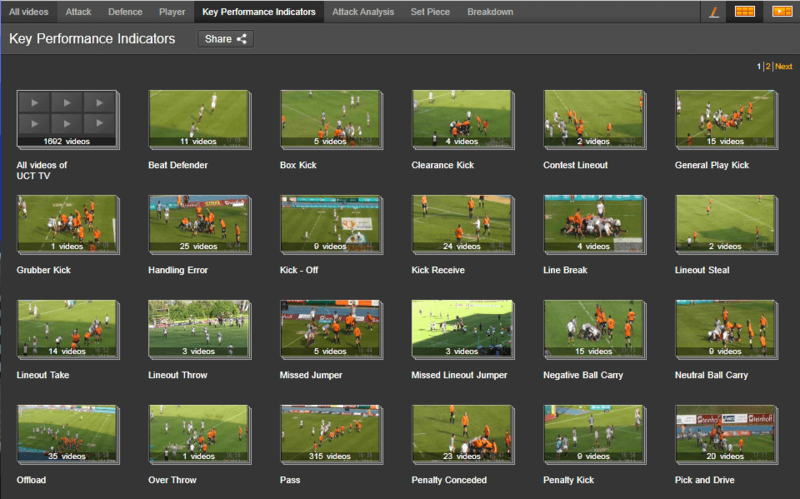 The great benefit of using Dartfish TV is that each clip can be commented on by the coaches and players alike and this creates a great discussion and a learning point for the players and coaches. I began the dialog for the second game uploaded by asking open ended questions and the players had to discuss the question about the clip concerned. I focussed on the backline moves as well as the forward phase play executions and from the dialog the players engaged in they were usually 100% correct in their observations and even came up with a few observations I had missed. That is the benefit of the flipped approach. The other way the coaches engaged with the players was for them to give the players tips and where they should have done something better. The set pieces were the main focal point for this type of dialog. 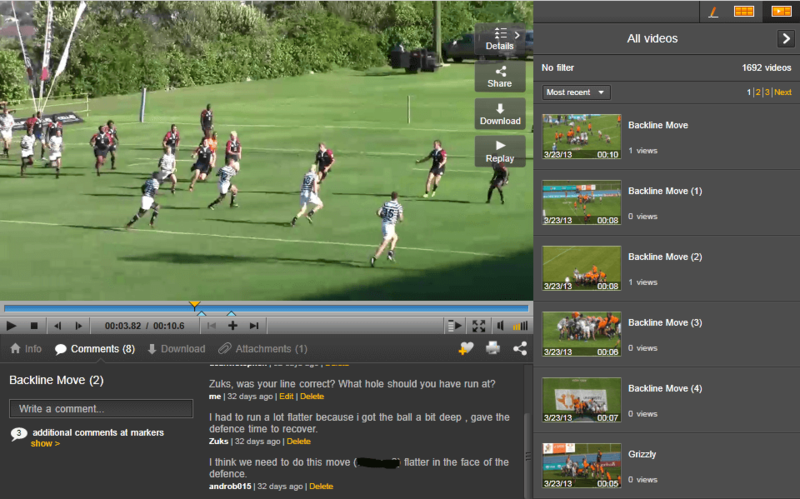 A great feature of Dartfish TV is that each player can download the clips they desire or the entire game onto their computers and make a compilation of the various aspects of the game they would like to view or study over an extended period of time. For example a prop could download every scrum throughout the year and check his progress and learn from his mistakes and by the end of the year he can do a season review of his performance at the scrum. This is entirely up to each player and they can do as much or as little as they want, but the most important factor of this is that it is available should they wish to further their career or performances. There have been challenges to this approach however as internet connectivity, access and speed is a problem where monopolies and company inefficiencies drive up the costs of internet in South Africa so many cannot afford it at home, while the speeds remain exceedingly slow – a 5mb line speed is highly unusual as most homes are throttled to lower speeds during the day. At the same time most players have an internet cap either at home or at the University (3GB cap) and this limits the amount of time they are able to spend online looking at the game footage. The only alternative is for players to frequent an internet café where speeds and reliability remain constant. However we have full time students and this impacts the amount of funds they have available or are willing to spend on internet, while going to an internet café is also inconvenient. The flipped approach to coaching is a fantastic tool in any coaches’ arsenal, however one thing that must be remembered is that it is highly time consuming and it requires a full time video analyst or a coach who does not mind giving up large portions of his/her week in front of the computer. The players themselves have to be committed to regularly going online and looking at the clips and to monitor this, the coach has got to be proactive and keep their finger on the pulse ensuring the players are actively involved in the coaching process. It is not an easy transition allowing players to analyse the games and come up with alternative opinions to what the coach thinks, but in my view there can be nothing better than having your entire team think like a coach on and off the field. By introducing this approach to the team we, as coaches are hopeful the players take the time out of their busy student lives to actually look at the game with the astute eye of a coach, but with the benefit of actually being in amongst the action. With this type of in-depth analysis our players theoretically should improve tremendously throughout the year and with the correct guidance they will hopefully become better students of the game and think more clearly on the field to make better decisions. To further this type of coaching in South Africa, I remain hopeful that internet speeds and uncapped availability becomes readily available in the next few years so that this approach can be extended to the majority of the sports teams as I firmly believe that this way of coaching has no peer.